Join us Wednesday, May 31, 2017 at 8pm at Roulette in Brooklyn! The M6, a vocal ensemble dedicating to performing more rarely heard compositions by Meredith Monk as well as new material, performs a collection of solo and group works, including the world premiere of a yet-to-be-titled work for six voices. Selections from Monk’s “Our Lady of Late” (1973) for solo voice and wine glass, “New York Requiem” (1993) written for Tom Bogdan during the AIDS crisis, “Calling” from “American Archeology #1: Roosevelt Island” (1994), “Basket Rondo” (2007) and Monk’s seminal “Dolmen Music” round out the program. The M6 is dedicated to continuing the legacy of legendary composer, singer and director Meredith Monk. The members of the group were among 19 singers chosen from around the world to participate in a professional training workshop offered by Monk and the Weill Music Institute at Carnegie Hall in January 2006, culminating in the Meredith Monk Young Artists Concert at Carnegie’s Zankel Hall. 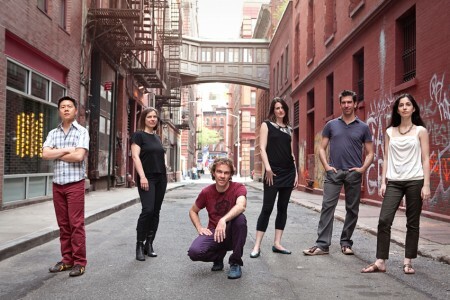 In 2007, The M6 formed out of the desire to continue learning Monk’s work through direct coachings with the composer herself, as well as with past and present members of her Vocal Ensemble. Since the majority of Monk’s work has been created and taught in the oral tradition, the group is devoted to immersion in this process and believes it is vital in order to assure that her extraordinary work lives on. Individual members are also working to transcribe more of Monk’s work in an effort to help document it for future generations. Appearances have included concerts at Zankel Hall, Whitney Museum, La MaMa, Symphony Space, The Stone, Roulette, and Issue Project Room, as well as performances and residencies at Trinity College in Hartford, Syracuse University, Bronx Community College, and Sarah Lawrence College. The M6 is Sasha Bogdanowitsch, Sidney Chen, Emily Eagen, Holly Nadal, Toby Newman and Peter Sciscioli. Individual member bios can be found here. Please contact us for high-resolution images. R755 theme designed by varometro. 32 queries in 0.850 seconds.